Aikido is a modern Japanese martial art founded in the mid-20th century by Morihei Ueshiba O'Sensei. Essentially nonviolent and noncompetitive, aikido aims to achieve harmony with others, the environment, and oneself. Rather than fighting or opposing, aikido trains us to meet the force of an attack with relaxation and a sense of center. Using fluid, spiral movements, the aikidoist blends with and redirects an attacker’s energy so that it defeats itself. Aikido requires no physical strength, and has the added, compassionate aim of protecting the attacker from injury. Beginners are welcomed to all classes and will receive one-on-one instruction in the basics. 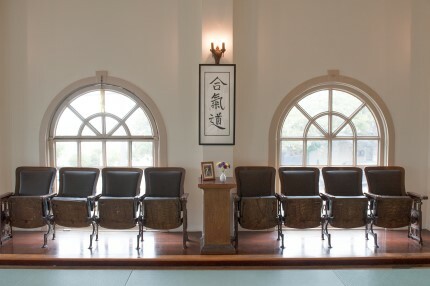 Our dojo constitutes a community of aikidoists, who meet together on the mat to practice and study this partner-based movement art. Our members span a broad range of experience: some have trained for many years, others only a few months. We are committed to training in an atmosphere of equality regardless of race, religion, gender, or sexual orientation. 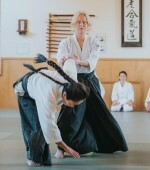 Linda Sensei will teach a seminar at our dojo on Sunday - we are so lucky to have her join us. 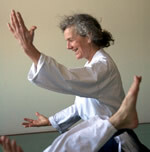 She is the author of “Journey to the Heart of Aikido” and travels to teach in other countries in Europe and Africa. On the first day of the new year, we join Aikidoka all over the world who traditionally gather for outdoor training on New Year’s Day. This year we will gather San Francisco's beautiful Dolores Park. Meet at Dolores Street at Cumberland by 10.30am.